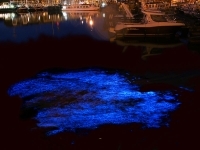 The water in Mosquito Bay sparkles like stars when disturbed due to the hundreds of thousands of bioluminescent dinoflagellates resident there. Of the bioluminescent bays all over the world, Vieques' Puerto Mosquito has been certified the brightest by the Guinness Book of World Records. A trip to Bio Bay, as it's locally known, is one of the best tourist attractions in Puerto Rico and well worth the excursion from San Juan. Several tour companies offer kayaking and snorkelling in the magical water, often ranked as one of the most romantic places on earth. The bioluminescence is at its brightest during the full or near-full moon, and this is considered the best time to visit.